Germany: Concentration camps in Emsland, Lower Saxony, Germany, are placed under the jurisdiction of the German justice department, meaning the SA will provide the guards for the camps. Germany: Adolf Hitler agrees to not intervene in Austria or add Austria to the German Reich. Spain: Day 313 of 985 of the Spanish Civil War. Spain: Day 678 of 985 of the Spanish Civil War. CBI - China: Day 323 of 2,987 of the 2nd Sino-Japanese War. Day 108 of 124 of the Battle of Henan. CBI - China: Day 688 of 2,987 of the 2nd Sino-Japanese War. CBI - Mongolia: Day 15 of 129 of the Battle of Khalkhin Gol, a border dispute between the Soviet Union and Japan. UK: British trade union executives accept Nye Bevan's manpower mobilization plan of setting up the Labor Supply Board and Production Council. ETO - Norway: Day 47 of 63 of the Battle of Norway. The Allies begin withdrawing out of Norway. ETO - Belgium: Day 16 of 19 of the Battle of Belgium. ETO - France: Day 16 of 44 of the Battle of France. The British troops at Calais reject the Germans call for surrender. Meanwhile, 15 French generals are relieved from their commands. Germany: The first transport of prisoners arrives at the Mauthausen-Gusen Concentration Camp in the occupied Austria region of southern Germany. CBI - China: Day 1,054 of 2,987 of the 2nd Sino-Japanese War. Day 193 of 381 of the Battle of South Guangxi. Day 25 of 49 of the Battle of Yichang. Atlantic: German sub U-103 sinks the Egyptian ship RADAMES off Monrovia, Liberia, and a few hours later sinks the Dutch ship WANGI WANGI. ETO - France: Pierre Laval criticizes the Vichy French government during an interview with American journalist Ralph Heinzen in Paris. Germany: German Navy Chief, Admiral Raeder warns that the US convoying of British war supplies will be considered an act of war. MTO - Greece: Day 6 of 13 of the Battle of Crete. The Luftwaffe attacks at Heraklion and Galatas in preparation for a ground offensive on the northern coast. MTO - Libya: Day 46 of 256 of the Siege of Tobruk. Middle East: Day 24 of 30 of the Anglo-Iraqi War in Iraq. East Africa: Day 350 of 537 of Italy's East African campaign in the lands south of Egypt. CBI - China: Day 1,419 of 2,987 of the 2nd Sino-Japanese War. Day 19 of 21 of the Battle of South Shanxi. 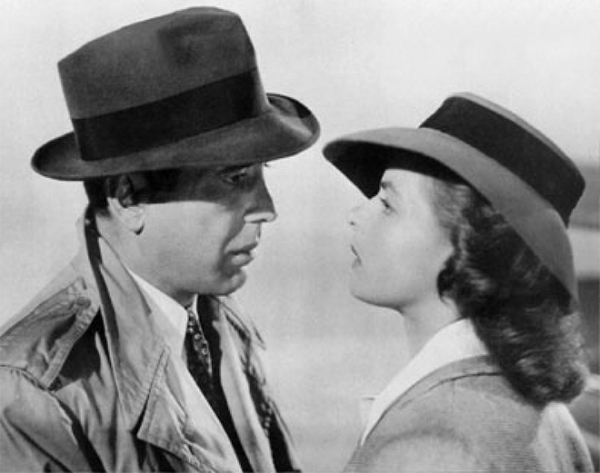 USA: Warner Brothers Studios begins filming the movie Casablanca. The unheard of Moroccan city of Casablanca in unoccupied French North Africa serves as an exit point for Europeans seeking to flee war-torn Europe. It will become a household word when the Allies invade on 08 Nov 42. The film, which had been scheduled for release the next spring, is rushed into theaters 20 days later. Ninety million Americans went to the movies every week during World War II. The war dramatically changed the nature of the movies, which were no longer mere entertainment, but a valuable morale-booster, a source of information and an instrument of public education. During WWII, the US government established the Bureau of Motion Pictures (BMP) to watch over the film industry. In its "Government Informational Manual for the Motion Picture Industry," the BMP asked every producer to consider one central question: "Will this picture help win the war?" The BMP reviewed every film made during the war, evaluating the contribution, or lack of contribution, that each film made to the war effort. Incidentally, Warner Brothers read the script for Casablanca on the same day that the Japanese bombed Pearl Harbor. Atlantic: Day 132 of 169 of Germany's Second "Happy Time," during which U-boats sink 609 Allied ships with little risk. Russian Front - North: Day 260 of 872 of the Siege of Leningrad. Russian Front - North: Day 21 of 658 of the Siege of the Kholm Pocket. Russian Front - Center: German troops launch Operation HANNOVER to clear the Bryanks-Vyazma rail line of all 20,000 Soviet partisan resistance fighters. Russian Front - South: Day 14 of 17 of the 2nd Battle of Kharkov, Ukraine. The Soviets are now completely surrounded and must try again to break through German lines. Russian Front - South: Day 208 of 248 of the Siege of Sevastopol, Crimean Peninsula. East Africa: Day 21 of 186 of the Battle of Madagascar. CBI - Burma: Day 163 of 164 of Japan's Invasion of Burma. The Chinese 38th Division begin arriving into India. US 10th Air Force B-17s night bomb at Rangoon. CBI - China: Day 1,784 of 2,987 of the 2nd Sino-Japanese War. Day 11 of 124 of Japan's Zhejiang-Jiangxi Campaign, launched to punish anyone suspected of aiding the Doolittle raiders in China. Roughly 250,000 Chinese will be killed. PTO - Australia: The Perth police arrest four Australians for planning to set up an Australia First Nazi-style government. PTO - Malaya: Day 96 of 357 of the Battle of Timor Island. PTO - New Guinea: US 5th Air Force B-17s bomb Vunakanau Airfield at Rabaul. Germany: 507 men and 528 women Gypsies are gassed at the Birkenau Camp. Seeing how many of them already had typhus, the camp writes off their deaths as being by natural causes. Russian Front - North: Day 625 of 872 of the Siege of Leningrad. Russian Front - North: Day 386 of 658 of the Siege of the Kholm Pocket. MTO - Yugoslavia: The British parachute agents into Yugoslavia to coordinate actions with local partisans. MTO - Italy: Day 4 of 20 of the naval and aerial bombardment of Pantelleria Island. MTO - Italy: US 9th Air Force B-24s attack the ferry docks and railroad yards at Messina, Sicily. MTO - Italy: US 12th Air Force RAF Wellingtons night bomb at Olbia, Sardinia. CBI - China: Day 2,149 of 2,987 of the 2nd Sino-Japanese War. Day 14 of 23 of the Battle of West Hubei. PTO - Alaska: Day 353 of 435 of the Battle of Kiska, Aleutian Islands. Day 15 of 20 of the Battle of Attu. The US continues mopping up, but discover that these Japanese troops just won't quit. US 11th Air Force provides air support. PTO - New Guinea: Day 34 of 148 of the 2nd Battle of Lae-Salamaua. US 5th and 13th Air Forces provide air support. ETO: US 8th Air Force B-17s and B-24s bomb rail installations and airfields in Belgium and France. ETO: US 9th Air Force B-26s attack bridges in Belgium, and airfields in France. Russian Front - North: Day 114 of 191 of the Battle of the Narva Isthmus, Estonia. Both German and Soviet troops remain in their defensive positions. Russian Front - South: Day 48 of 60 of the Battle of Romania, 1st Jassy Offensive. MTO - Yugoslavia: Germany launches a combined ground-airborne assault on Tito's headquarters in Drvar, Bosnia. MTO - Italy: Day 125 of 136 of the Battle of Anzio. RAF and US Air Forces provide air support. All Germans retreat from Anzio as troops from the US 5th Army link up with the troops at the Anzio beachhead. MTO - France: US 15th Air Force B-17s and B-24s attack targets in the Rhone River Valley. CBI - Burma: Day 82 of 166 of the UK's Operation THURSDAY. UK Chindit troops abandon the Blackpool site. CBI - Burma: Day 77 of 147 of the Battle of Myitkyina. US 10th Air Force provides air support. CBI - Burma: Day 55 of 302 of the Chinese Salween Offensive. US 14th Air Force provides air support. CBI - China: Day 2,515 of 2,987 of the 2nd Sino-Japanese War. Day 39 of 259 of Japan's Operation ICHI-GO.Japanese troops capture Luoyang. Day 39 of 39 of the Battle of Central Henan, the first offensive in Japan's Operation ICHI-GO. Chinese troops drive the Japanese out of central China. CBI - India: Day 79 of 118 of the Battle of Imphal-Kohima. PTO - Alaska: US 11th Air Force B-24s bomb targets in the Kurile Islands. PTO - New Guinea: Day 163 of 597 of the Battle of New Britain. US 13th Air Force provides air support. PTO - New Guinea: Day 34 of 481 of the Battle of Western New Guinea. 5th Air Force provides air support. PTO - Philippines: The USS FLYING FISH sinks a Japanese transport and damages another transport. PTO - Solomon Islands: Day 207 of 295 of the Battle of the Bougainville Islands. US 13th Air Force provides air support. CBI - China: Day 2,880 of 2,987 of the 2nd Sino-Japanese War. Day 55 of 91 of the Battle of Zhijiang. US 14th Air Force provides air support. Japanese troops begin pulling out of China. Day 47 of 60 of the Battle of West Hunan (near Zhijiang). Japanese troops continue withdrawing from southern China. PTO: US Joint Chiefs of Staff approve Operation OLYMPIC, the invasion of the main islands of Japan, scheduled to begin no later than 01 Nov 45. The war, of course, will end two months before that date arrives. PTO - Alaska: US 11th Air Force bombs the Tagan Cape area on Matsuwa Island. PTO - Dutch East Indies: Day 25 of 52 of the Battle of Tarakan Island. PTO - Japan: US 20th Air Force B-29s night bomb at Tokyo. PTO - Japan: Day 55 of 83 of the Battle of Okinawa. Kamikazes hit and sink the destroyer USS BATES and damage several other ships. Meanwhile, the USS BLENNY sinks a small Japanese vessel. PTO - New Guinea: Day 515 of 597 of the Battle of New Britain. US 10th Air Force provides air support. PTO - New Guinea: Day 399 of 481 of the Battle of Western New Guinea. US 10th Air Force provides air support. PTO - Philippines: Day 217 of 299 of the 2nd Battle of the Philippines, aka the Liberation of the Philippines or the Philippines Campaign. PTO - Philippines: Day 162 of 244 of the Battle of Luzon. 5th Air Force provides air support. PTO - Philippines: Day 77 of 159 of the Battle of Mindanao Island. 5th Air Force provides air support. PTO - Philippines: Day 69 of 135 of the Battle of the Visayas region. US 5th and 7th Air Forces provide air support. Poland: Rudolf Höss is handed over to Polish authorities.